With the season changing to fall, we thought it a great time to take a drive to the mountains of the Blue Ridge and the beautiful Shenandoah Valley. 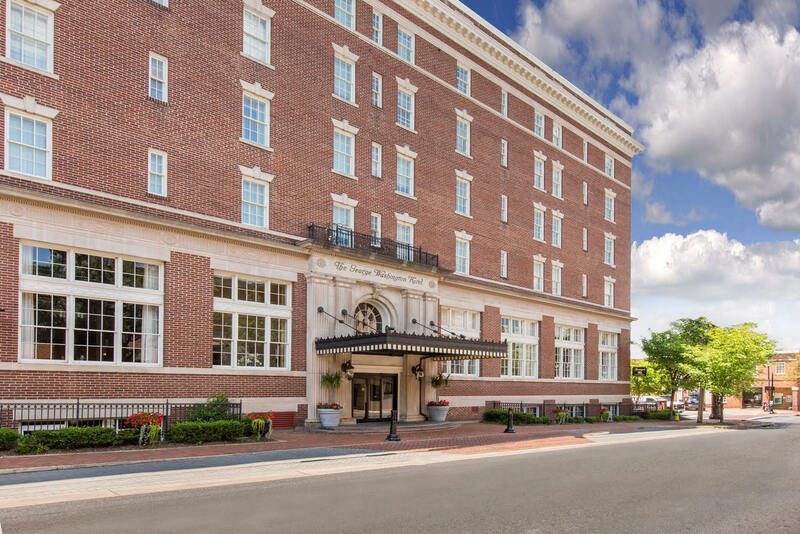 Our destination was Winchester, Virginia and the beautifully restored George Washington Hotel, a Wyndham Grand Hotel. The drive from Alexandria is also a beautiful journey this time year as you pass through small towns, rolling hills and Virginia wineries along Route 50, where travelers from the ports of Alexandria and Georgetown followed it to Winchester at the lower end of the Shenandoah Valley for trade. As with any new and growing area, the history of the Shenandoah has been steeped in conflict, turmoil and growth, from the Shawnee and Iroquois Six Nations, the arrival of European settlers, the French and Indian War, the Revolutionary War and the Civil War. Today this history still lives in Winchester, and waits to be discovered. Winchester is the county seat of Frederick County. The rolling hills and rich farmland makes for absolutely beautiful country, particularly this time of year. If you plan to make the trip I would recommend spending at least one night and there is nowhere better located than the George Washington Hotel. Situated in the heart of downtown Winchester, it is close to many historical landmarks as well as Old Town Winchester’s two-block pedestrian mall. The first of its kind in Virginia. The pedestrian mall features many unique restaurants as well as a variety of shops, boutiques and specialty stores. For a fall adventure, most of the cafes and restaurants have outdoor seating along the open- air mall. One of our favorites was Lloyd’s Tropical Island Coffee and Café. With Lloyd “Everything be Irie, Mon.” This easy going Jamaican transplant is a blast. Armed with a big smile and a bigger laugh, he makes you feel welcome. 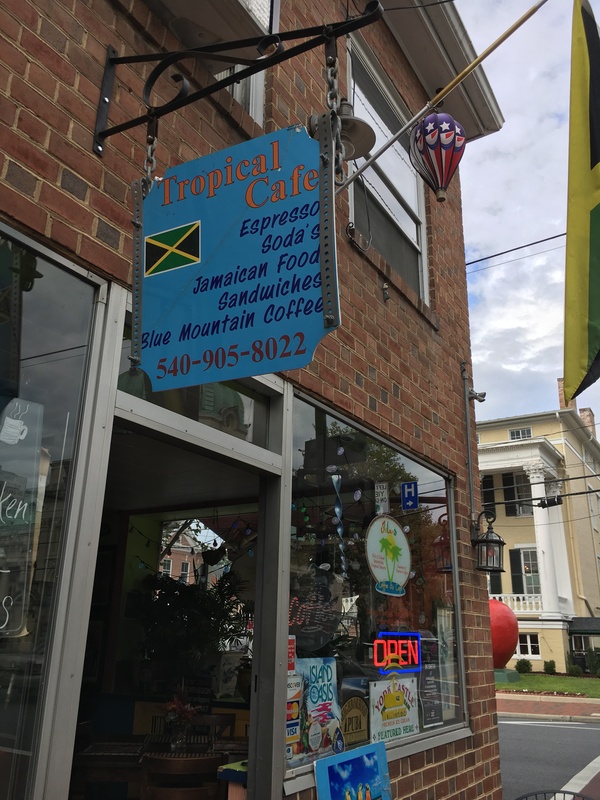 Lloyd and his wife serve up Jamaican coffee and cuisine and I hear the Jerk chicken is to die for! 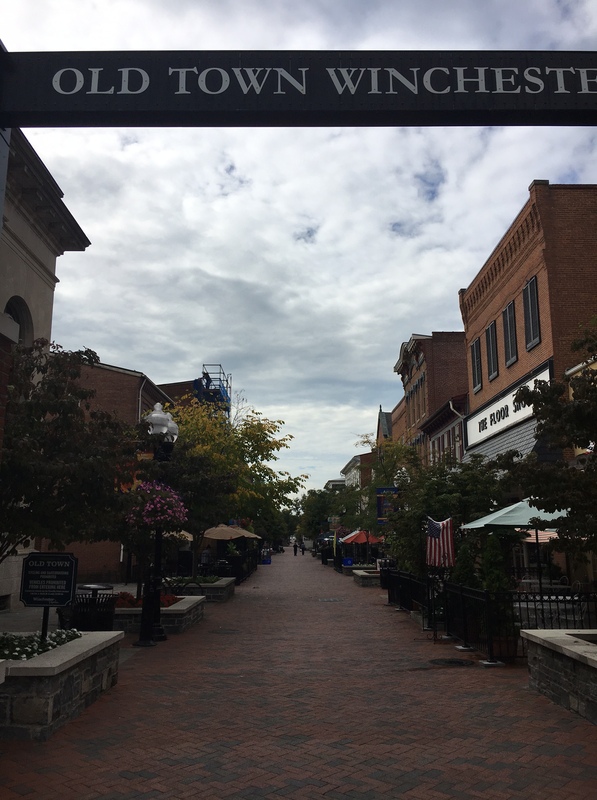 Old Town Winchester is located within the heart of a 45-block National Register Historic District and in addition to the shopping and dining you can visit the many museums located in and around the mall. Stonewall Jackson’s Headquarters Museum, George Washington’s Office Museum, the Old Courthouse Civil War Museum and the Shenandoah Valley Discovery Museum are all located within a comfortable walking distance of each other and convenient parking. The four Auto Park garages located in the area only cost $10.00 for the day…a very good deal. We had reservations at the beautiful George Washington Hotel. As I mentioned earlier, this hotel is in the middle of everything and you can spend a whole day just walking. This historic hotel was built in 1924 by The American hotel Corporation as part of their “Colonial Chain” of hotels. Like many hotels of the era, the property was built in close proximity of a Baltimore & Ohio train station and was constructed to provide lodging to railroad passengers. The station still remains across the street today. Originally the five- story hotel was built in the shape of an “L”, with a rear one-story kitchen wing. It contained 102 rooms and 45 baths. The lowest level contained a barbershop, cafeteria, candy shop and men’s furnishing shop. In 1929 an additional wing was added to the hotel, which provided 50 more guest rooms. In 1950 the property was remodeled to include a Howard Johnson’s restaurant. With the construction of interstate highways and widespread availability of motorcars, railroad travel began to decline. Undoubtedly, this change in travel options contributed to the closing of the property as a hotel in 1978. The property was then operated as The George Washington Home for Adults from 1978 to 1993. It then lay vacant until 2004. That year it was purchased and renovation work began which lasted until the property reopened in April 2008. The property has undergone a complete renovation and revitalization. It now includes 90 guest rooms, and indoor pool and hot tub, fitness room, and their signature restaurant “Georges Food and Sprits”. The property contains all the amenities of today while capturing the historical elements that make it so unique. The simple patterns of the muted fabrics relive a time long ago and the antique pieces scattered about make it truly seem that you have stepped back in time. They even have the antique mailbox that sits between the two elevators on the lobby floor with the glass shoot that allows a letter to be posted on any floor and dropped in the slot for pickup by the mailman. 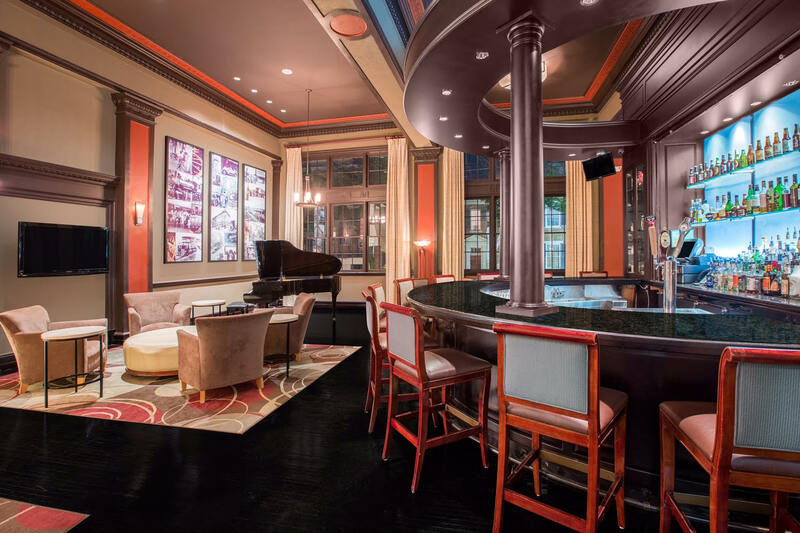 There is also a massive elegant bar that dominates the main foyer near the front desk and behind the bar there are couches and chairs among the wall murals that offer a nice quiet hideaway. On a personal note, I have to give recognition to the staff of this classic hotel. From the first person you meet to the last, they are probably the most gracious and professional group I have ever run across…and it begins with the first phone call. Probably the two biggest claims to fame in Winchester is country singing legend Patsy Cline and the annual Apple Blossom Festival. Patsy Cline was born Virginia Patterson Hensley on September 8, 1932. Virginia, known to her family and friends as Ginny began singing on nights and weekends at the age of 16, as she tried to help support her family. Patsy quickly rose to stardom as she won amateur contests, sang on local radio stations and performed with a number of bands. On March 5, 1963, her life was tragically cut short in a multiple fatality plane crash. 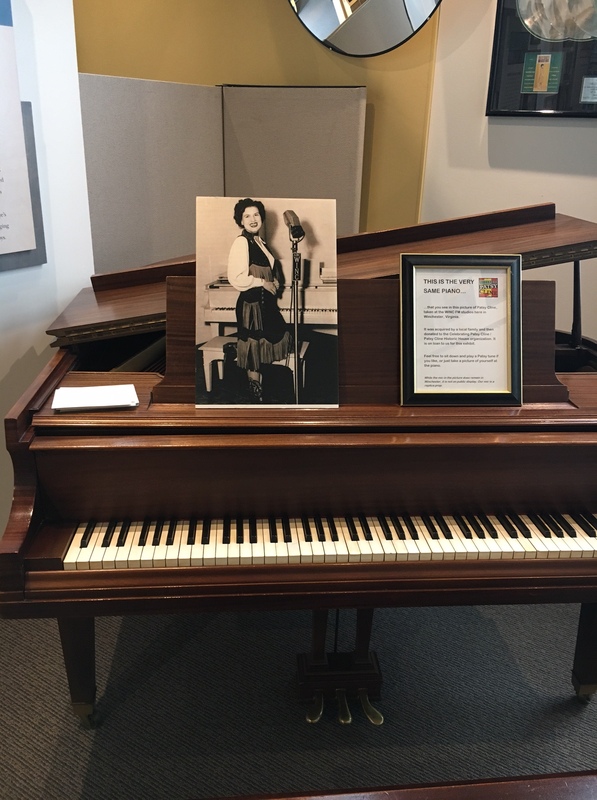 Patsy is remembered as a musical icon and Grand Ole Opry favorite with her popular hits, Crazy, I Fall to Pieces, and Walking after Midnight. The Patsy Cline House is located at 608 S. Kent Street, in a working-class neighborhood of Winchester and was her home from 1948 to 1953. The annual Apple Blossom Festival is the signature event for Winchester. For 90 years this event has been a tribute to the apple industry in Frederick County. In late April and early May the town and over 250,000 visitors get together for a week or so of events, dances, parades and just about anything else. The whole town comes out to decorate so they can put their best foot forward. A bit smaller fall event – The Apple Harvest Festival – takes place in early October. This year it falls on the 7th and takes place at Marker-Miller Orchards. Stephens City, five miles south of Winchester, is the second oldest town in the Shenandoah Valley. During the late 18th and early 19th century, the town was renowned for its production of wagons. Situated as it is on present-day U.S. 11 – formerly known as the old ValleyTurnpike or the Great Wagon Road – town inhabitants have witnessed the movement of travelers for over 250 years. Five more miles down the Great Wagon Road is the town of Middleton. Located in this quaint Frederick County town is the Wayside Inn, reportedly America’s longest-running inn. While in Middletown a visit to Belle Grove Plantation is a must. Originally the center of a 7,500-acre grain plantation, today Belle Grove is a Historic Site of the National Trust for Historic Preservation, and partner in Cedar Creek and Belle Grove National Historical Park. In the early 19th century, Belle Grove’s fields were used to grow wheat, barley and other grain crops. Livestock grazed in pastures north and west of the mansion. In the fall of 1864 these peaceful fields were at the epicenter of the pivotal Civil War “Battle of Belle Grove,” later called the “Battle of Cedar Creek.” Restored to agricultural use after the war, Belle Grove continues to operate as a working farm. On October 14th and 15th you can join spectators and re-enactors for a commemoration of the largest Civil War battle in the Shenandoah Valley held on the original battlegrounds in Middletown. Battles are on Saturday and Sunday. Engage in military, civilian and living history camps. Photographer Chester Simpson has been photographing reenactments for a number of years and declares Cedar Creek is the best of them all. At one point the abundance of grain at Belle Grove was tempting enough that a distillery was constructed on the property. Although all that is left is the history, our friends at Copper Fox Distillery make a whiskey called 1797, which is sold in the state as a memento and recognition of Belle Grove. With the changing of leaf color every day now, it is a great time to take the 75-mile drive to Winchester Virginia and enjoy the history, and then write your own chapter. Note: While you are in this beautiful part of America, take the time to check out our friend Bill Schwasta at the Rocking S Ranch outside of Winchester. Enjoy the fall colors from horseback with a real Virginia cowboy! Happy Trails…see his ad in this issue!